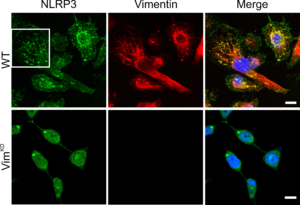 Vimentin (red) interacts with the NLRP3 inflammasome (green), as shown in cells activated with an inflammatory stimulus. While inflammation usually protects the body from injury, infection and toxins, sometimes the immune system response goes too far and itself causes harm. A new Northwestern Medicine study shows that a protein called vimentin may help activate an inflammatory response that leads to acute lung injury. The paper, published in Nature Communications, demonstrates that vimentin acts as a key regulator for a set of protein interactions that can cause inflammation and thick, stiff scarring in the lungs called pulmonary fibrosis, which makes it difficult for patients to breath. “This study advances our understanding of vimentin and the role that it plays in orchestrating early inflammatory responses of the innate immune system,” said senior author Karen Ridge, PhD, associate professor in Medicine-Pulmonary and Cell and Molecular Biology. 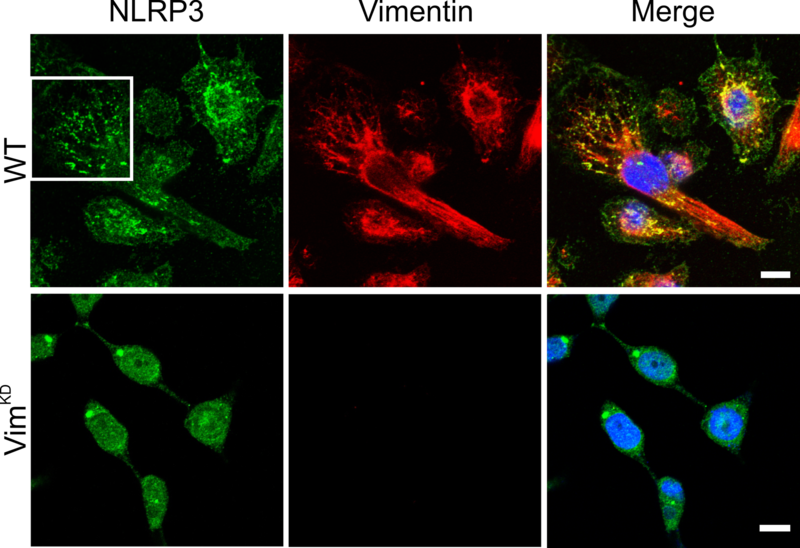 Specifically, Ridge and colleagues showed that vimentin acts as a scaffold in cells where a multiprotein complex called the NLRP3 inflammasome can assemble. There, the complex activates caspase-1 and then IL-1β, the protein that ultimately induces the injuries to the lungs. Karen Ridge, PhD, associate professor in Medicine-Pulmonary and Cell and Molecular Biology, was senior author of the study. The scientists tested three different mouse models of lung injury in the study and found that vimentin deficiency consistently reduced the inflammatory response that leads to lung injury and pulmonary fibrosis. Ridge’s lab prevented the production of vimentin in mouse models genetically; in future research, they hope to develop tools to do so pharmacologically. The group is also investigating how the same protein is involved in the stabilization of the NLRP3 inflammasome in response to influenza. This study was supported by National Heart, Lung, and Blood Institute grants HL71643, HL124664, T32HL076139 and K08 HL093216; the Department of Veterans Affairs MERIT Award; and American Heart Association grant 10PRE4210064.